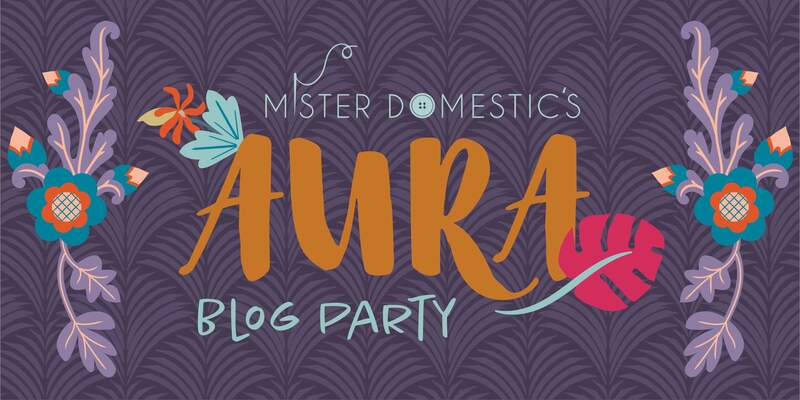 I am so glad today is my day on the Mister Domestic Blog Party because I can’t contain my excitement any longer, I have SO much to share with you. 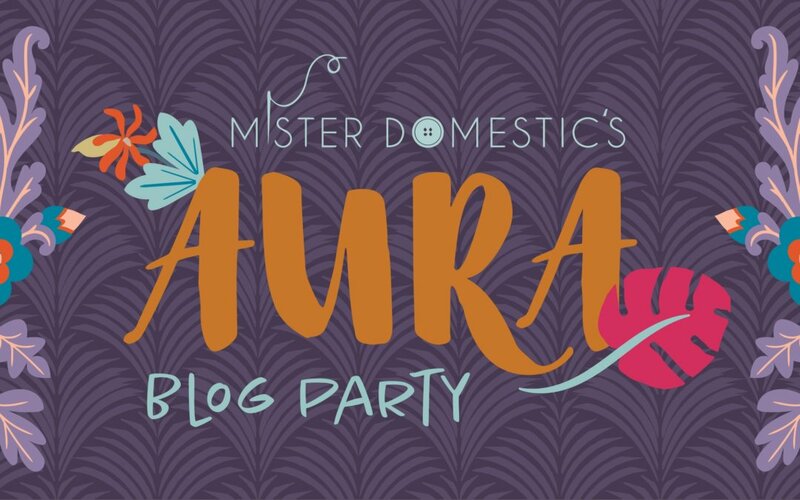 When the fabulous, Mister Domestic asked if I would like to be a part of his blog party for his brand new fabric range, Aura- I jumped up and down with excitement. What an honour. To make this blog party even more special, I am thrilled to be releasing a new pattern today that I know you are going to just love!! I love knowing the story behind a fabric line and this one is extra special. Matthew tells me that Aura was inspired by a daddy-daughter trip with his gorgeous girl, Helena to Hawaii! And when you look at the Aura range of fabrics you totally get a beach boys good vibrations feel, it is just so fresh and fun! I love the beautiful florals but my all time fav in this collection is the adorable sea turtles ((AUR-44904 Hawaiian Honu Dusk). They are just so cute!! 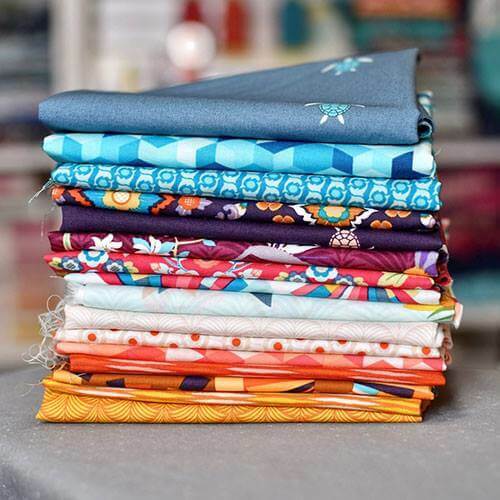 The Aura range is printed by Art Gallery Fabrics which means it compliments loads of their solids beautifully especially one of my AGF faves, the denim coloured cotton, this is one of my all time favourite ‘base’ fabrics. I found it to be the perfect contrast with the beautiful colours in the Aura collection and couldn’t wait to get this project happening. I the quality and feel of AGF fabrics, the quality is top notch and a pleasure to sew with. Let’s get this party started and have a look at…The Stack’s On Duffle Bag. 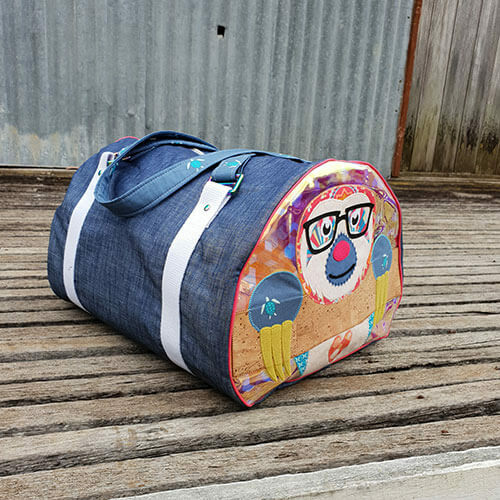 For so long, I have wanted to make the perfect bag for kids to take to Grandma’s house or for you to take on the plane as hand luggage. I have been working on this design for the past 8 months and FINALLY it has come to life. 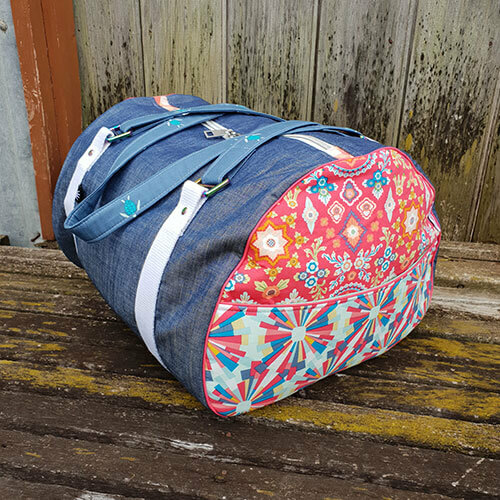 This isn’t just any duffle bag, it is a duffle bag that has a ‘magic’ lining, that’s right, NO drop in lining or bias binding in sight! You will love the construction of this bag which is what has taken me so long to work out. (Shout out to Susie from Twirl Girl Boutique for your help with this, I am so grateful). When all the stars aligned and I received the parcel of Aura fabric from Mister Domestic and the Stacks On Duffle Pattern testing was coming along nicely, I wanted to make a version that would truely be mind blowing for the blog party. What better way to do that than collaborating with the fabulously talented, Mandy from Sew Quirky. Squeal!!! I am a long time fan of Mandy’s work. She designs the most adorable applique designs which have sass and are super fun to create. Mandy has made an applique that fits perfectly on the side of the Stacks On Duffle, which I know you are going to love just as much as I do!! 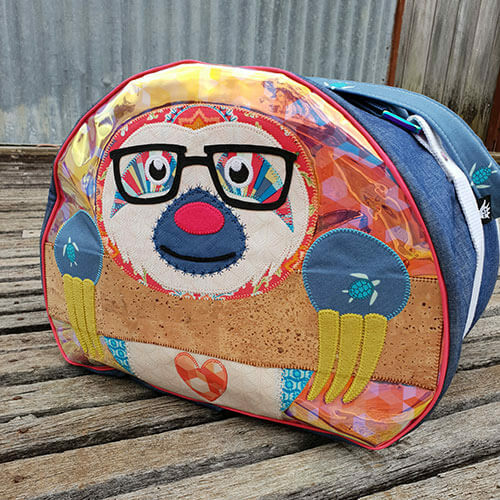 Without further ado…let me introduce you to – Cuddleee The Sloth and The Stacks On Duffle Bag. Isn’t this just the cutest!! Mandy made this adorable Cuddleee The Sloth applique on iridescent see through PU Vinyl. It is perfect for showcasing Mister Domestic’s AGF Aura fabric, I love how the colours peep through behind this adorable sloth. The branch that Cuddleee is leaning over is made using natural cork, and his claws are felt. 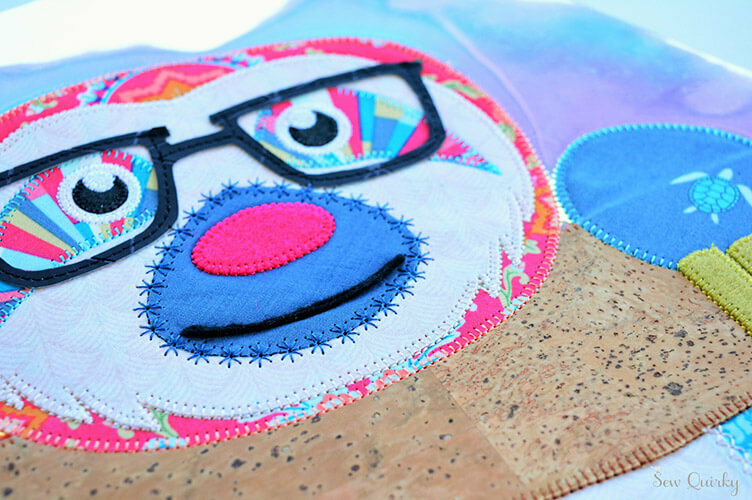 All these different textures give the applique unique character which is just so fun! Look at the gorgeous little turtles on his hands too! 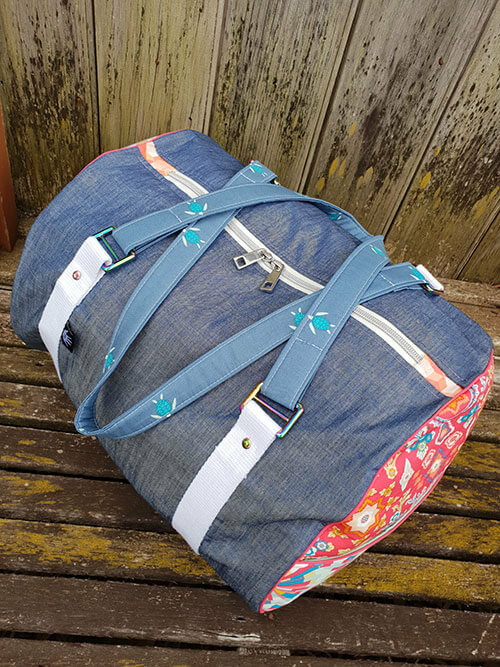 The other end of the Stacks On Duffle Bag features the standard side pocket included in the pattern. I chose two gorgeous prints from the Aura collection called Aloha Spirit Hibiscus (AUR-44900) and Lei Burst Plumeria (AUR-44907), and ‘framed’ them with hot pink piping to make them pop even more. The colours in this collection are so bright and beautiful I really like them paired with the AGF Denim. My favourite Aura print is definitely the sweet turtles, don’t they look great on the duffle handles! And if you know me, you know how much I love all things shiny! This webbing from Sew Quirky has a silver sparkle through it and is oh so pretty. 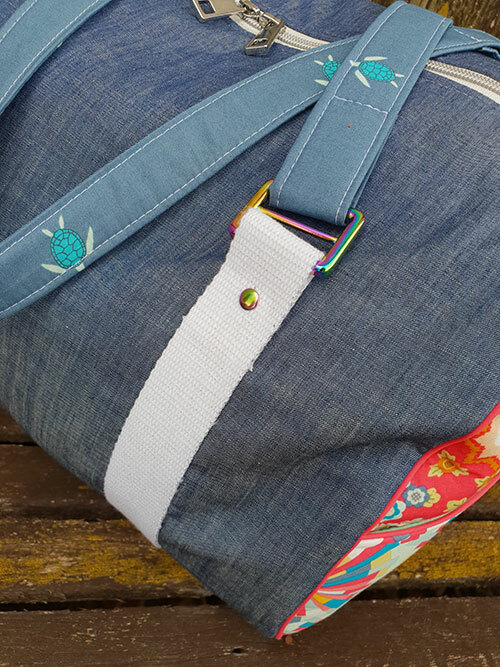 I used rainbow hardware and a silver double pull zipper from Who Says Sew. 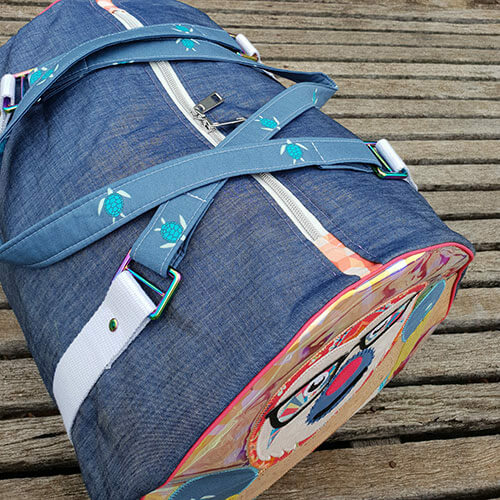 If you would like to make your own version of The Stacks On Duffle Bag, you can grab the pattern now. 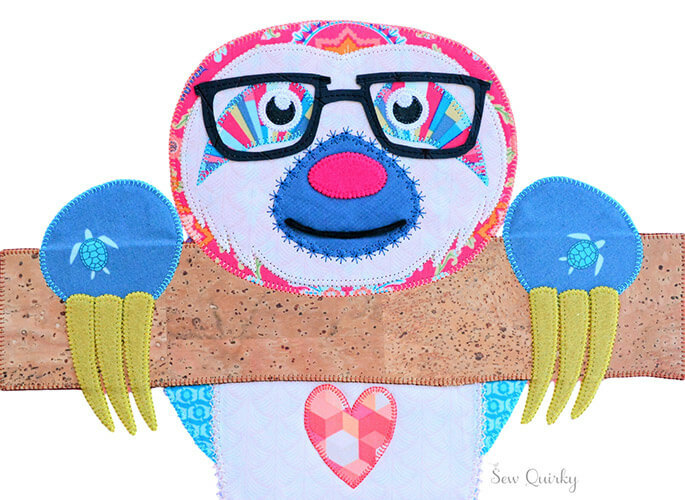 If you would like to add Cuddleee The Sloth applique you can grab this pattern from Sew Quirky now also!! Thankyou so much Mandy for working with me on this amazing collaboration, it was so much fun! And thankyou Mister Domestic for having me as part of the Art Gallery Fabrics Aura Blog Party, it was such an honour. 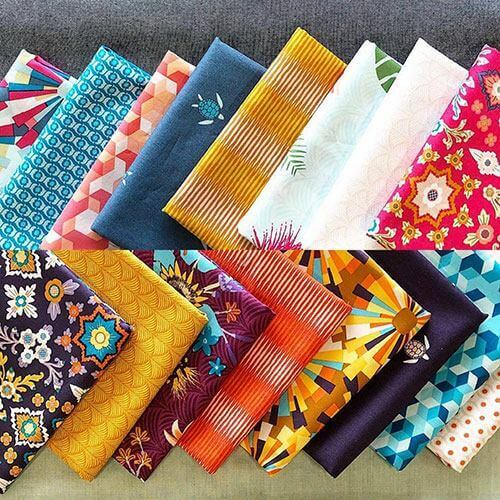 Keep an eye out for this delicious fabric range in your local quilting store, I know you will have fun sewing with it. Be sure to check out the rest of the blog party using the list below.